Earlier today NVIDIA held one of their their longest GTC keynote ever, lasting approximately three hours. During which the company unveiled their new Jetson Nano mini PC and announce that NVIDIA would allowing rudimentary DXR ray tracing support to older hardware that do not support RT cores. 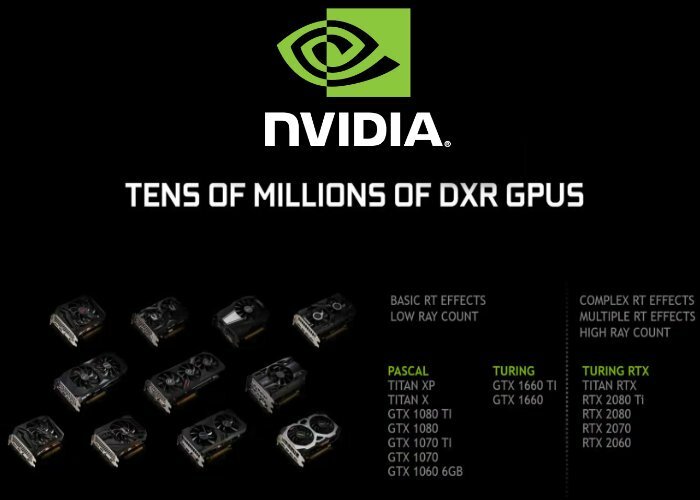 Rolling out in next month’s drivers update, NVIDIA will allow DXR support for 10-series Pascal-microarchitecture graphics cards GTX 1060 6GB and higher, as well as the newly announced GTX 16-series Turing-microarchitecture GPUs GTX 1660, GTX 1660 Ti. The Tech Power Up website explains more. As soon as more information is announce confirming the release date for the new NVIDIA update we will keep you informed as always. But for now to learn more about the new NVIDIA DirectX Raytracing (DXR) support jump over to the Tech Power Up website by following the link below or watch the full keynote via the NVIDIA website here.